I recently started working on a project that would benefit greatly from the ability to support plugins that were developed by someone other than myself or anyone else who necessarily had access to our source code. Having never really done anything like this myself I set off and tried to research it. I found a lot of information about loading compiled .dll files, using reflection and Activator.CreateInstance and so on. Then in the comments of those posts I’d see someone say “Why don’t you use MEF?” and that’s it; no other information. Managed Extensibility Framework (MEF) is a component of .NET Framework 4.0 aiming to create lightweight, extensible applications. It allows application developers to discover and use extensions with no configuration required. It also lets extension developers easily encapsulate code and avoid fragile hard dependencies. MEF also allows extensions to be reused across applications. MEF was introduced as a part of .NET 4.0 and Silverlight 4. Additionally, here is the MSDN page for your reference. In my research, I found a lot of great examples of using MEF to quickly load external dll files and instantiate the types that they had defined within them. The problem was, all of the examples I found had all of the projects (application and plugins) contained within a single solution. I wanted to know how to enable someone else to take my plugin specification and implement it, without me having to distribute my entire solution to them. I never did find a true tutorial on that aspect of MEF, but I did figure out a way that works and that is the way I am going to present in this series. If anyone happens upon this series and has a better method, I’d be happy to learn from you! In this series of posts I am going to go through the process of creating a .NET 4.0 Windows Forms application that implements a simple plugin system. The plugins system will load any available plugins on startup and allow the user to enable/disable them. I will then create an entirely separate solution that creates some example plugins that can be loaded an used by my original program. This should simulate the workflow that I would expect a third-party developer to go through to develop plugins for my application. The series will consist of 3 posts. The first post, which you are now reading, will serve as the introduction and cover the initial application (without plugin support). In the second post, I will add plugin handling capabilities to the application, and in the third post I will create a couple sample plugins within their own solution. I’m going to use Visual Studio 2010 for this project. I will include zipped archives for both solutions at the end of the series. 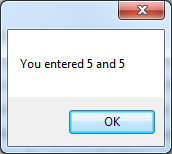 To start out, I have created a simple application that allows the user to enter two numbers, then reports back to them what they entered. This concludes the first post of the series. 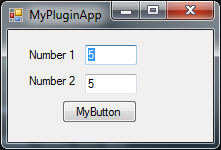 In the next post I will add the capability for my application to load and utilize plugins. This entry was posted in .NET, C# and tagged csharp, Managed Extensibility Framework, ManagedExtensibilityFramework, MEF, Plugin on August 5, 2014 by Alan.